The sun radiates a broad range of light from 300-1100nm. In agriculture, this total radiation is needed primarily to calculate Evapotranspiration (ET). ET is the amount of moisture leaving the ground through evaporation (from the ground) and transpiration (from the leaves), and is dependent upon light, wind speed, temperature, and relative humidity. Sensor drift is 1% per year and includes built-in level. We are engaged in offering Irrigation On/Off Sensors to our clients. It requires low maintenance and is designed with high quality material under the supervision of our talented and skilled team who assures the best quality and scheduled delivery to our clients. Our team of skilled professionals makes sure to manufacture the product using advanced tools and technologies. It is available in competitive prices of market. 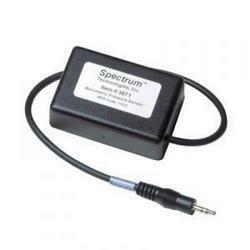 Manufacturer: Spectrum Technologies When used in conjunction with a watermark Soil Moisture Sensor, you can analyze the relationship between irrigation On periods and the corresponding change in soil moisture levels. Sensor plumbs into the irrigation line. The pressure switch trips On at 5 PSI ( /- 1.0) PSI). A detailed Irrigation Report in specware software describes daily irrigation activity. Manufacturer : Spectrum Technologies Silicon Pyranometer Sensor to use with your Watch Dog Data Logger. Works with Watch Dog Logger Models 200, 225, 425, 450, Stations 2525, 2550, 2600, 2700, 2800 Watch Dog Silicon Pyranometer Sensor Measures broad range of light from 300-1100nm. The sun radiates a broad range of light from 300-1100nm. In agriculture, this total radiation is needed primarily to calculate Evapo transpiration (ET). ET is the amount of moisture leaving the ground through evaporation (from the ground) and transpiration (from the leaves), and is dependent upon light, wind speed, temperature, and relative humidity. Can be programmed to record in either metric ( mm ) or U.S. (inches) of Hg. All sensors include a 6-foot cable with pin-type connector. To connect an external sensor to the logger, plug the sensor cable into the logger port that has been programmed for that particular sensor. If the sensor is not connected, the message "sensor error" will appear on the LCD display for the respective logger port until the sensor is connected.